My mother called me at work shortly after the Canadian women’s hockey team won gold at the Vancouver Olympics. She could barely contain herself. The airline was having a one-day fire sale to commemorate Canada’s growing medal count at the Winter Games. I quickly got ahold of my boyfriend and, never one to keep things to myself, convinced him to fly to China with me. It occurred to me that for all of China’s booming economy and strong political presence, it’s still an underdeveloped country that takes pains to shield the world from its imperfections. I’d been in Beijing 10 years ago and still remember the yellow glow of designer stores, empty except for the clerks. At the time, street wear was defined by various shades of basketball jerseys. Self-expression, in other words, was a luxury few could afford. This time around, I noticed not only the abundance of fashionable young women, but it was men that were noticeably leading the pack. And though GQ China launched last fall, I saw more men taking their style cues from East Coast party rockers than mainstream tastemakers. We landed in Hong Kong and took the 24-hour train to Beijing. The capital city isn’t known for its stylistas. Migrant workers lay about the side of the road in their wife-beaters shovelling gravel under the hot sun. Parks are populated with war veterans practicing tai chi, their high-collars referencing Mao suits of yore. Then there are those women dressed head-to-toe in Louis Vuitton, legs wrapped in Chantilly lace as if suffering a skin disease. Style enclaves are few, but they exist. Monochromatic palettes are hard to pull off without the help of exaggerated shapes. Here, the focus is on the silhouette: tights and clompy boots. The white shirt is untucked to keep it looking undone, but the subtle patterning gives it depth of texture. It was rare to see this kind of punk-ish masculinity expressed without pretension. His leather satchel caught my eye as the patina was gorgeous! The brass detailing gives it an authentic heft and added a ‘British schoolboy’ appeal to his look. Being over-matched tends to remind people of ’80s bridal parties, but this totally works because of the color. The suede and white piping lend a dash of luxe to the purple loafer while the unstructured cardigan gently reaffirms the key component. The amount of expats working and living in both Shanghai and Hong Kong give these cities a peculiar East-meets-West feel. While the culture is most defiantly Asian, these cities derive their aesthetics — both personal and corporate — from Paris to New York. Japanese fashion magazines populate newspaper kiosks, but they seem to cater mostly to women. Benjamin works for an indie record label in France. He was with his friend, Pierre (below), for the Shanghai World Expo. I like that he updates the skateboarder uniform (i.e. high-tops and shorts) just by changing the proportions and rolling up the hem. The boots make it. Along with the khaki jacket, they play off the military trend everyone’s loving. He looks like a modern-day James Dean. Those blue shoes really jump out at you from the rest of his outfit. It’s like, torn jeans, faded shirt, then BAM! Shows that you only need one great accessory to take an outfit to another level. He was dressed to the nines in a quiet garden in Old Shanghai. I mean, oxfords, silk blazer, flashy YSL belt, and an ascot? Beautiful. The skinny jeans prevent the outfit from being too stuffy. My boyfriend pointed him out as we searched for a bank. He was from Finland and had a great smile. That playfulness really translated sartorially: the plainness of his slip-ons nicely contrasted with his striking cassette tape t-shirt. I saw Y-3’s logo plastered across young men in Hong Kong. This guy, however, used it more discreetly. The subtle branding extended to his brushed steel cuff, which had the designer’s name engraved so lightly on the surface that I couldn’t make it out from a foot away. 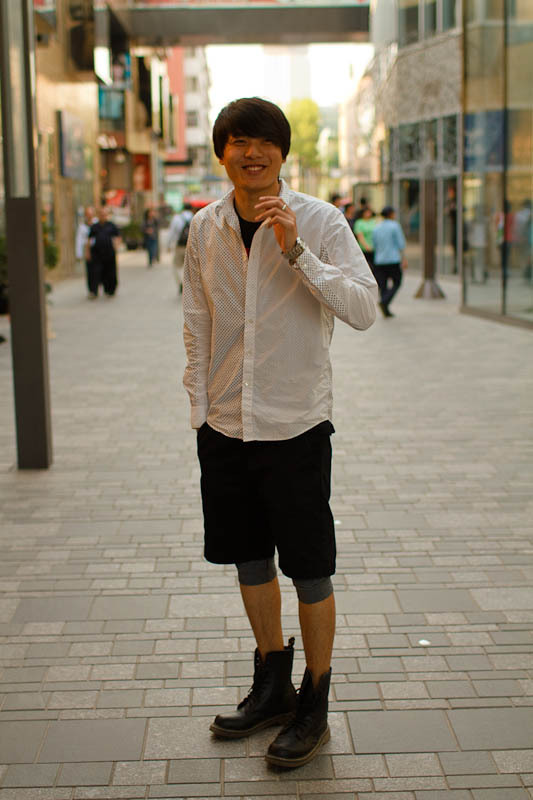 It was exciting to see Chinese men welcome color into their wardrobes. 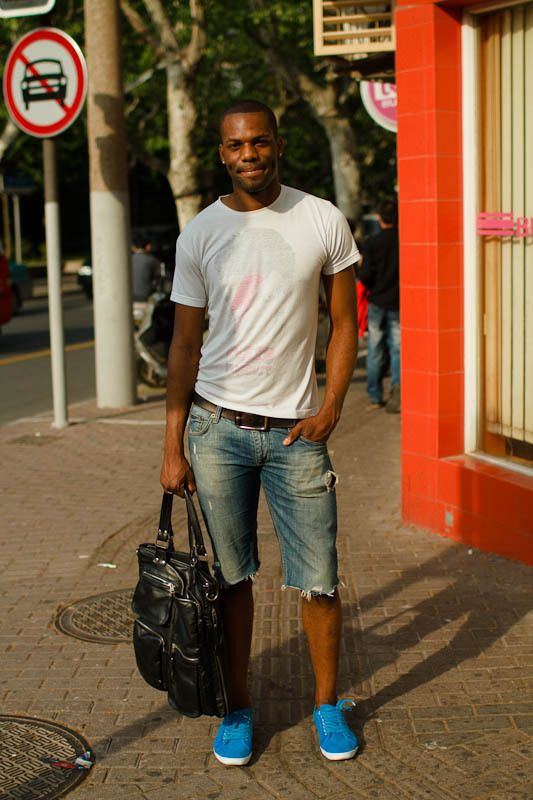 Skinny jeans, canvas slip-ons, and polos showed up prominently during my travels. Very JFK, but often paired with psychedelic sneakers and sky-high hair. 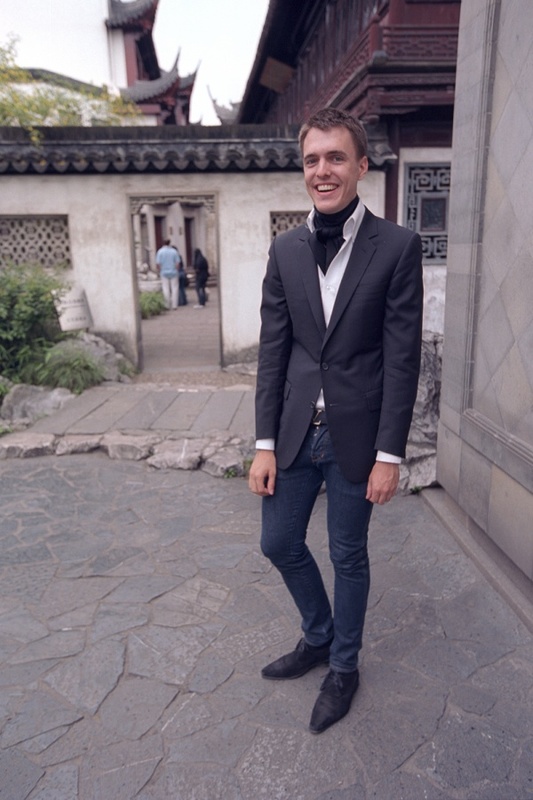 Although the looks I encountered weren’t entirely androgynous, it’s become obvious that the style-conscious man in China has now become just as aware of the importance of style and sartorial elegance as his continental counterparts. It’s true. I took a lot of styling cues from the guys while I was in Hong Kon. But the women… I felt that in general, they’re taking things on that don’t match their body types. Also, they wear too many accessories and look too busy in general. New feature section? I like it!! Just a little something we’re trying out. I really enjoyed reading this section, I sent the link to a few of my guy friends. 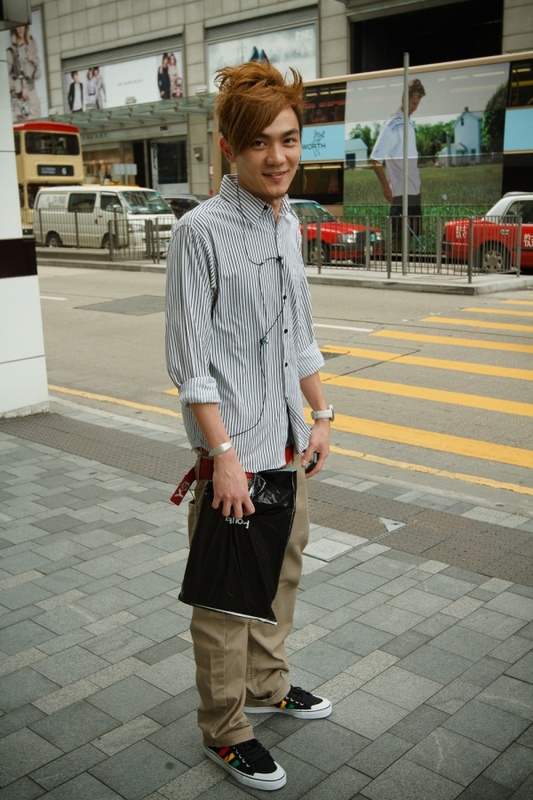 I wish that men in Toronto would take a few fashion tips from those stylish men in Hong Kong. It’s refreshing to see men dressed trendy yet unique. This was nice and quite refreshing. The two greatest things in this world (to me) are: culture & great writing. You’re 2-0 here. You, also, have an awesome eye for what is fashionable and not necessarily trendy. I enjoyed that because most fashion bloggers fall into the serpent sea of trends. Glad you didn’t!